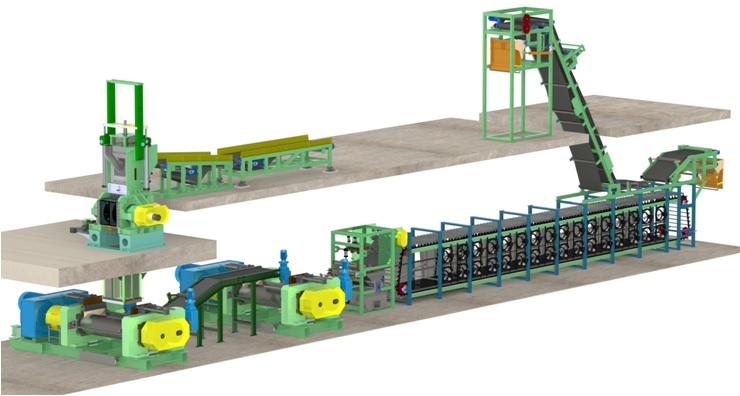 Twin Screw Sheeter replaces the dump-mill and sheeting mill combination in a traditional rubber mixing line (an image you had seen in my earlier post – Single-Stage or Two-Stage Mixing?). This means you could visualize Twin Screw (Extruder) Sheeter, as a rubber machinery that accepts mix compound directly discharged from an internal mixer into its hopper chute and converts it into a continuous, seamless rubber sheet that is then fed into a Batch-Off Cooling Line. For those who have been following my blog, you have already viewed a video of this equipment in action in my earlier post Rubber Mixing Room. When you explore this equipment for purchase, you should not be surprised with different OEM’s calling it in similar sounding names. For example, you will get a Conical Twin Extruder (CTE) with Roller Head from Colmec SpA, Twin Screw Roller Head Extruder (TSR) from Kobelco, Twin Screw Discharge Extruder (Convex™) from HF Mixing Group or simply Twin Screw Sheeter (TSS) from other rubber machinery manufacturers like Bainite Machines. In construction, they all appear similar as shown below. For reading simplicity, let me address this machinery simply as “TSS” for the rest of this article. You will find the TSS to be ideal for conventional and diverse applications including tire manufacturing, custom compounding, hose & belt manufacturing and technical rubber goods production. So, here’s why we love Twin Screw Extruder Sheeter (And, I feel, You Should, Too!). Energy Saving: Rubber compounding is a energy-intensive process. So, any technological advancement that has the potential to reduce energy consumption receives my first preference (and I hope you will agree with me here). Let me help you with a quick back of the envelope calculation. If you are using a 270 Liter Tangential Internal Mixer, you are engaging at least two units of 26″x84″ two-roll mills in the downstream section. Each 26″x84″ two-roll mill, requires around 180 kW (minimum) motor power – totaling to 360 kW (=180 x 2) only for the mills. For a similar capacity mixer, a TSS downstream will not seek more than 300 kW power (again, there is energy-efficient models available here). So, this rough calculation, when a TSS replaces the traditional dump-mill with sheeting mill set up, straightaway gives you 16.7% savings in energy (60 kW less). Labor: The second aspect is the reduction is labor cost. Unlike two-roll open mills (with or without ), where you will need two separate operators, a TSS can be set up to perform sheeting function of rubber sheet without an hands-on operator at its vicinity. Even if not fully automated, you do not need an operator once the discharge of rubber sheet from TSS is fed into a Batch-off. Reduced Contamination: In open two-roll mixing mills, your rubber mixing is exposed to the environment and it is difficult to control any dirt or moisture absorption by the compound during milling process. In a TSS, this is eliminated. Your rubber and its recipe constituents are mixed and sheeted-out in a closed environment under temperature controlled conditions right from the time you feed it into your internal mixer. Hence, with reduced contamination, you get a guaranteed higher quality of your mix compound. Self-Cleaning Feature: The Screw and Barrel of the TSS is at a downward inclination (15º) angle from the feed chute section to exit of the roller die head. This incline ensures that compound flow to the exit of the barrel is reinforced and no material remains inside the TSS – hence, the self-cleaning feature. High Mixing Line Efficiency and Productivity: When you install a TSS , your compound batch from the internal mixer is converted into a continuous sheet and the working of TSS can be automatically synchronized with rubber mixing line speed. This in turn, improves the mixing line performance making it more efficient. The continuous sheeting without operator involvement increases your mixing line throughput and overall productivity. Original Equipment Manufacturers (OEM) can offer you customized TSS models beneath internal mixers with throughput capabilities from 500 Kg per hour to 21000 Kg per hour (….and that’s a vast range by all means). Effective Temperature Control: Your rubber compound discharge temperatures from TSS is reduced while sheeting out the material because no additional work (hence no additional heat) is introduced into your compound. Additionally, there is circulation of tempered (or chilled) water inside the conical twin screws, barrel and the peripherally drilled rolls of the roller die. This flowing water facilitates an effective heat exchange to take away the heat from the rubber mix and reduces the compound temperature at the discharge sheeting section. Compact Layout: Most manufacturers offer various drive options, making the design of the TSS very compact yet sturdy. This means that a TSS can be accommodated under most internal mixers starting from the lowest production range of 16-25 Liter capacities based on the OEM standards. Easy Maintenance: Further, the screw tips of the energy-efficient conical twin-screws do not touch each other and hence there is minimized wear of the screws. A rapid action hydraulic cylinder arrangement for clamping and moving the roller-die calender on rails facilitates the cleaning of the screw tips and insides of the barrel tip during your scheduled maintenance. Also, the TSS does not require external pushers, as in case of single-screw dump extruders. These features make a TSS maintenance easy for you. Additional Features: With increasing trend of Silica usage in rubber compounding, you need to be cautious of the metallurgy and surface treatment characteristics of any rubber compounding machinery you buy. Hence, explaining the major ingredients of your recipe to your OEM is of paramount importance. For example, in TSS you can seek rollers that has hard-surfaced rolls if you are processing silica compounds. This will minimize the compound sticking to the TSS roll and increase its life. Lastly, this physically very sturdy and robust, rubber machinery is designed for intrinsically safe mixing line operation. Summarizing, with its capabilities for conventional and diverse applications, a TSS is emerging as the standard downstream equipment in the rubber compounding process for masterbatch and final mixing lines. And that is why we love Twin Screw Sheeter. Categories: Compounding Machinery, Extrusion Machinery, Mixing Machinery, Non-Tire Rubber Industry, Tire Industry | Tags: batch off, Belt, Colmec, Conical Twin Extruder, Convex™, CTE, custom compounding, finals mix, HF Mixing Group, Hose, Kobelco, masterbatch, mixing line, Peripherally Drilled Rolls, Rubber Machinery, rubber mixing, Rubber Mixing Room, technical rubber goods, tire manufacturing, TSR, TSS, Twin Screw Discharge Extruder, Twin Screw Roller Head Extruder, Twin Screw Sheeter, Two-Roll Mill | Permalink.